Home › Omgai 30Cm 8 Tubes 144 Led Meteor Shower Rain Lightsdrop/Icicle Snow Falling ..
Omgai 30Cm 8 Tubes 144 Led Meteor Shower Rain Lightsdrop/Icicle Snow Falling ..
High Quality & Energy Efficient: Waterproof, dustproof; transparent PC material, corrosion resistant, cost resistant, aging resistant, more durable; free from time and space constraints. Low power consumption and energy saving. Specs: tube length: 11.8inch/ 30cm; tube quantity: 8 tubes; LED bulbs of per tube: 18; number of LED bulbs: 8 tubes x 18LED (144LED Lights); plug type: US plug; Voltage: 110V-220V, Watt: 5W; IP65 waterproof. Meteor Shower Effect with Romantic Aesthetic: Led meteor shower lights, the light of every bulb turns on and out one by one in sequence and quickly just like meteor shower or falling snow in the night sky, multi-colored, very beautiful. It can be used as one, or be connected (as much as five string lights). Perfect for: Christmas, New Year,Home Decor, Birthday Party, Valentine's Day, Business Celebration and any celebrating time, market engineering lighting, architectural decoration, decoration of trees along streets, parks, river, urban night lighting, attractions landscaping, gardening, community night crystal decoration, hotels, shopping malls, night entertainment all over the environment decoration. Package Content: 1 x OMGAI LED Meteor Shower Light; Zero-Risk Purchase, 90 Days 100% Satisfaction Guarantee and Our Friendly Service - 24 hours email customer service response. Color:colorful Description: led shower meteor rain lights,meteor effect, romantic aesthetic Low-voltage power supply, IP64 waterproof,more durable. Every bulb turns on and out one by one in sequence like snowfall, richer colors, very beautiful. Widely used for market Engineeringlighting, architectural decoration, also good to use to decorate trees alongstreets, parks, rivers, urban night lighting, attractions landscaping,gardening, community night crystal decoration, hotels, shopping malls, nightentertainment all over the environment decoration. Features: 1.The string canbe used as one, and be connected (as much as five light strings).2.Certificated by CE. 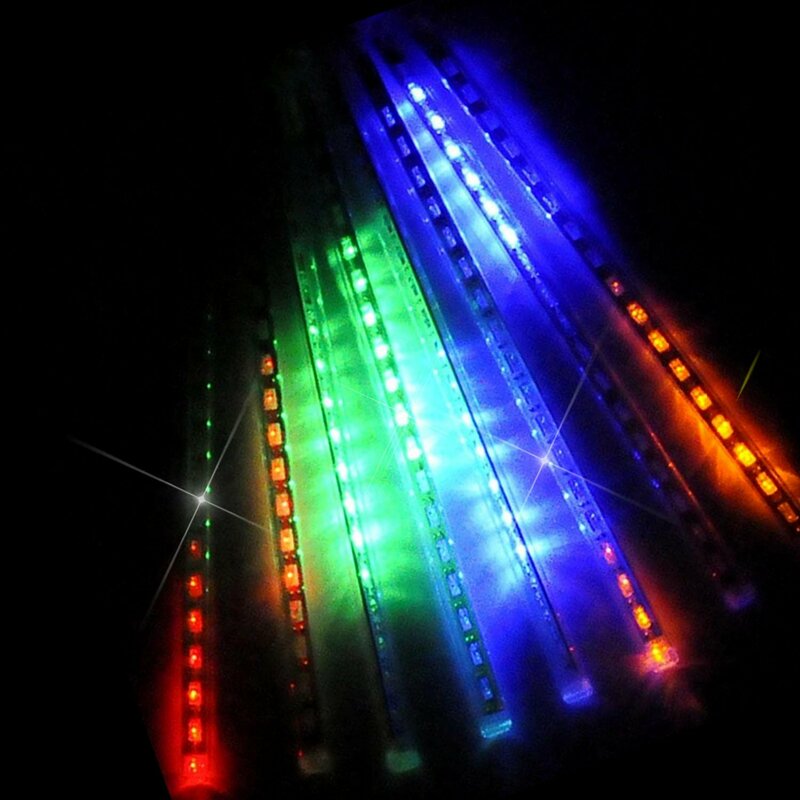 Package includes: Pack of 1: 8144 led meter shower rainlights. Notes: Please note that the plug is NOT waterproof so that please keepthe plug away from water . Please make sure the male/female connectors areconnected correctly, if you can not turn on the light, it is caused by thefalse connection for the connectors, please disconnect them, change anotherdirection to connect them again The actual item's colour maybe slightlydifferent from the picture shown due to the lighting when the picture was shotand the monitor.